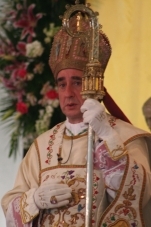 In an interesting development reported by various sources and being circulated on the Traditional Catholic web network, His Excellency Bishop Fellay of the Society of St. Pius X has received a former Orthodox Prelate into full communion with the Catholic Church. Most important to note, this action has received the recognition of Cardinal Levada and his Congregation for the Doctrine of the Faith. Such an action drastically calls into question their alleged stance that the Society of St. Pius X is itself not in full communion with the Church. How can someone outside of the Church receive someone into the Church? He can't. Of course the Society and its supporters have long fought the hated vile thrown at them by modernists in Rome and around the world. This development is another reason to question the accuracy of those same modernists from Rome. Recall these were the same one said that the Traditional Latin Mass was forbidden - that is until His Holiness Pope Benedict XVI declared in Summorum Pontificum that it was "never abrogated." These were the men to have said that the Society of St. Pius X was in schism. Then they changed their minds and said that only the priests were in schism. These were the men who said that those who receive the Sacraments offered by the Society are in schism. His Holiness Pope Benedict XVI, in response to the Hawaii Six, declared otherwise saying that reception of the Sacraments by any Society priest or bishop is not schismatic. These were also the same men to say that the Society priests and bishops was in schism to then change their stance to not say they are instead "not in full communion." And with this development, it's apparent that the Society is not in "not full communion." So what slander will be brought against the lawfully founded and canonically recognized Society of St. Pius X and its Econe seminary next? Only the demons know. 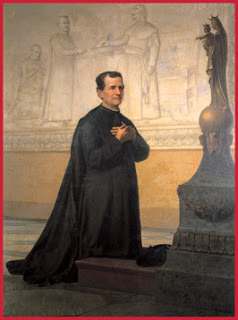 Today is a feastday (III class) of the holy St. John Bosco (1815 - 1888). St. John Bosco was a man of God, who besides his many miracles and ordinary life of holiness, received visions of Mary and numerous prophetic dreams. One of these is a famous dream of a Pope dying with another pope rising up to steer the Church to safety. This famous dream is called the Two Pillars. St. John Bosco worked countless miracles. He had the gift of multiplication of the loaves, and St. John even raised a boy from the dead to give him the chance of a good confession. The boy confessed his sins and died, but this time he went straight to Heaven. 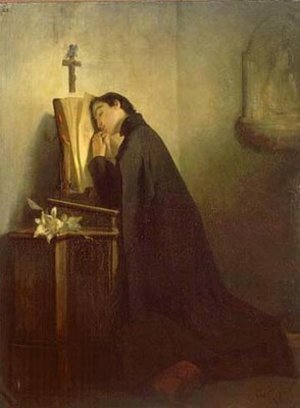 St. John Bosco was ordained a priest in 1841, and he worked tirelessly with young boys in his neighbor. His goal to make saints out of them, and at least one of his boys became a saint, St. Dominic Savio. St. John founded the Oratory of St. Francis de Sales, and was the chaplain there. He opened up workshops there for tailoring and shoemaking to help the boys not only grow spiritually but have enough money to live. St. John lived daily for Jesus Christ. He would rise early, hear Confessions, and write letters to those in need for hours into the night. He wrote over 130 works defending the faith, and for that he was hated by the enemies of the Church of God. There were numerous plots to kill him though none succeeded. In 1854, St. John Bosco formally banded together under the patronage of St. Francis de Sales. With Pope Pius IX's encouragement, St. John Bosco founded the Salesians in 1859, a missionary and education work. 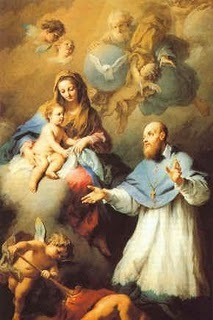 O God, Who didst raise up saint John Thy Confessor to be father and teacher of youth, and by him, with the help of the Virgin Mary, dist promote new families in Thy Church: grant, we beseech Thee, that inflamed by the same fire of love, we may win souls and serve Thee alone. Through our Lord. ADORE GOD, all you His angels: Sion heard, and was glad; and the daughters of Juda rejoiced. Ps. 96, 1. The Lord hath reigned; let the earth rejoice: let many islands be glad. V. Glory be to the Father, and to the Son, and to the Holy Ghost. As it was in the beginning, is now, and ever shall be, world without end. Amen. COLLECT - O GOD, WHO knowest that we are beset by perils so great as to be unendurable be cause of our human frailty, grant us health of mind and body, so that by Thine assistance we may conquer the things with which we are afflicted because of our sins. Through Our Lord Jesus Christ, Thy Son, Who liveth and reigneth with Thee in the unity of the Holy Ghost, God, world without end. Amen. BRETHREN, owe no man any thing, but to love one another; for he that loveth his neighbour hath fulfilled the law. For thou shalt not commit adultery, thou shalt not kill, thou shalt not steal, thou shalt not bear false witness, thou shalt not covet, and if there be any other commandment, it is comprised in this word, thou shalt love thy neighbour as thyself. The love of our neighbour worketh no evil. Love, therefore, is the fulfilling of the law. THE GENTILES shall fear Thy name, O Lord, and all the kings of the earth Thy glory. V. For the Lord hath built up Sion, and He shall be seen in His majesty. LESSER ALLELUIA - ALLELUIA, alleluia. V. Ps. 96, 1. The Lord hath reigned, let the earth rejoice: let many islands be glad. Alleluia. AT THAT time, when Jesus entered into the ship, His disciples followed Him. And behold a great tempest arose in the sea, so that the ship was covered with waves, but He was asleep. And they came to Him and awaked Him, saying, Lord, save us, we perish. And Jesus saith to them, Why are ye fearful, O ye of little faith? Then rising up, He commanded the winds and the sea, and there came a great calm. But the men wondered, saying, What manner of man is this, for the winds and the sea obey Him? Let us adore the power of our Emmanuel, who is come to calm the tempest which threatened the human race with death. In the midst of their danger, the successive generations of men had cried out: Lord! save us; we perish. When the fulness of time had come, he awoke from his rest; he had but to command, and the power of our enemies was destroyed. The malice of the devils, the darkness of idolatry, the corruption of paganism--all yielded. Nation after nation was converted to Jesus. They had said, when in their misery and blindness: "Who is this Jesus, whom no power can resist?" and then they embraced his Law. 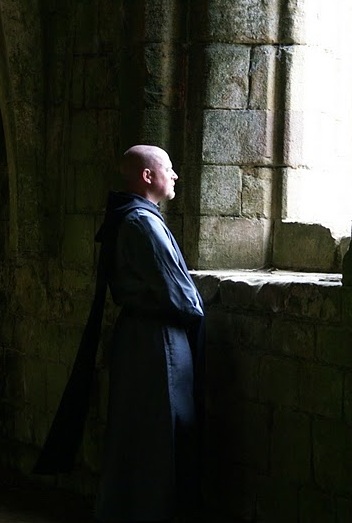 This power of Jesus to break down every obstacle, and that, too, at the very time when men were disquieted at his apparent slumbering, has often shown itself in the past ages of the Church. How many times has he not chosen for saving the world that period which seemed the least likely for rescue! The same happens in the life of each one among us. Oftentimes we are tossed to and fro by violent temptations; it would seem as though the billows must sink us; and yet our will is firmly anchored to God! And what is all this, if not Jesus sleeping in the storm-tossed boat, protecting us by this his sleeping? And if our cry for help at length awaken him, it is only to proclaim his own and our victory; for he has already conquered, and we have conquered in him. SECRET - GRANT WE beseech Thee, almighty God, that this sacrifice offered to Thee, may purge us of all evil and fortify our weak nature. Through Our Lord Jesus Christ, Thy Son, Who liveth and reigneth with Thee in the unity of the Holy Ghost, God, world without end. Amen. POST COMMUNION - MAY THY gifts, O God, free us from the allurements of earthly things, and ever restore us with heavenly nourishment. Through Our Lord Jesus Christ, Thy Son, Who liveth and reigneth with Thee in the unity of the Holy Ghost, God, world without end. Amen. And let us not cease in praying that these people will worthily receive the Sacrament of Confirmation. Here is a great piece, likely much overlooked by the media, on the pro-abortion man that is Warren Buffett. Warren Buffett’s comment that the rich should pay higher taxes, now enshrined by President Barack Obama as the “Buffett Rule,” is drawing much applause. What is not being discussed is the billionaire’s support for anti-Catholicism. First some background information. Over several decades, Buffett has spent a fortune funding radical abortion organizations like NARAL and Planned Parenthood; he has lavishly given money to train a new generation of abortion physicians; he has spent millions to help RU-486 (the abortion-inducing drug) to win FDA approval; and he gave his pro-abortion, population-control friends at the Bill & Melinda Gates Foundation nearly $31 billion in 2006 for more of the same. There’s nothing anti-Catholic about any of this, but when he intentionally seeks to subvert Catholicism by dishonestly funding pro-abortion organizations that have hijacked the Catholic name, that’s another story. To be specific, Buffett has given hundreds of millions over the years to anti-Catholic front groups like Catholics for Choice (formerly Catholics for a Free Choice) and its sister organization in Latin America, Catholics for the Right to Decide. In 2010, the Susan Thompson Buffett Foundation alone gave $759,822 to the former, and almost $1.7 million to the latter. These letter-head organizations wouldn’t exist if they depended on donations from members—they don’t have any—they exist because of the likes of Warren Buffett. If Buffett, or someone like him, were to throw millions upon millions funding Jews for Jesus, what would the Jewish community call him? Now you know why Warren Buffett has earned the tag anti-Catholic. In honor of the upcoming Feast this Sunday of St. Francis de Sales (Bishop, Confessor, and Doctor of the Church), Angelus Press Online has made available an article for free entitled St. Francis de Sales: Patron and Hero of Journalists. The article is written by Fr. Francis Gallagher and is a highly appropriate read for this time of year. Appropriate words for the Gospel reading for the Third Sunday after Epiphany. These are taken from the Roman Breviary. If you are not familiar with the story of Fr. (now saint) Damien of Molokai, please get a copy of the film showing his life and missionary work on a colony of lepers. You can then grasp the extent of leprosy and see just how horrific of a incurable condition it was. When the Lord was come down from the mountain, great multitudes followed Him. They were not able to follow Him when He went up. And first there came a leper. This poor creature's disease had prevented him from hearing the Saviour's long sermon on the Mount. Let it be noted that he is the first person specially named as being healed. The second was the Centurion's servant; the third was Peter's wife's mother, who was sick of a fever at Capernaum; the fourth were they who were brought unto Christ as being troubled with evil spirits, from whom He by His word cast out the evil spirits, at the same time that He healed all that were sick. And, behold, there came a leper, and worshipped Him, saying properly after preaching and doctrine cometh occasion for a sign, that the power of the miracle might confirm in the hearers the truth of the teaching that had gone before. Lord, if Thou wilt, Thou canst make me clean. He that prayeth the Lord to have the will, doubteth not but that He hath the power. And Jesus put forth His hand, and touched him, saying I will; be thou clean. As soon as the Lord put forth His Hand the leprosy departed. Let us remark how lowly and unbragging is the Lord's language. The leper had said, If Thou wilt; the Lord answereth, I will. The leper, Thou canst make me clean, the Lord, Be thou clean. Most Latin readers, misled by the identity of form in that language between the Present Infinitive Active and the Second Person Singular Present Imperative Passive of the Verb, read Christ's answer as if it were, I will to make thee clean. This is wrong. The sentences are separate. First cometh the expression of volition, I will, then the command, Be thou clean. And Jesus saith unto him See thou tell no man. What need was there to tell what his body showed? But go thy way, show thyself to the Priest. There were divers reasons why Christ should send him to the Priest. First, for humility's sake, that He might show reverence to God's Priest. 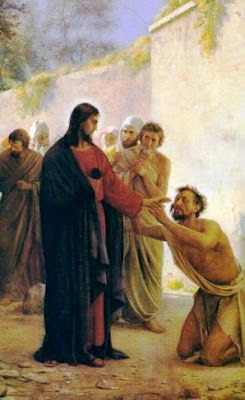 Then there was a command in the law that they that were cleansed of leprosy should make an offering to the Priests. Moreover, that, when the Priests saw the leper cleansed, they might either believe in the Saviour, or refuse to believe; if they believed, that they might be saved, and, if they believed not, that they might have no excuse. Lastly, that He might give no ground for the accusation that was so often brought against Him, that He was unobservant of the law. 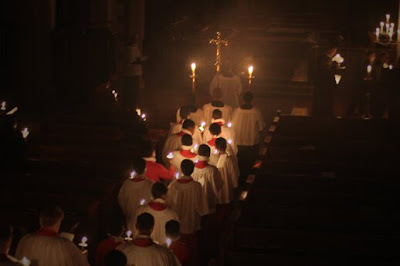 While I have posted photos in the past of a Tridentine Nuptial Mass and shared a post on Choosing Music for a Tridentine Nuptial Mass, I wish to share this video of a beautiful Solemn High Mass said in the Traditional Form of the Roman Rite. Very beautiful indeed. 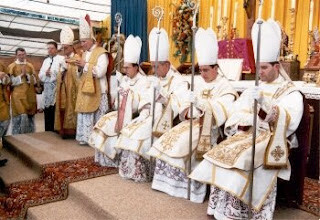 This Solemn High Nuptial Mass was celebrated on January 9, 2010. The celebrant, Fr. Brendan Kelly, was assisted by the pastor of North American Martyrs Catholic Church, Fr. 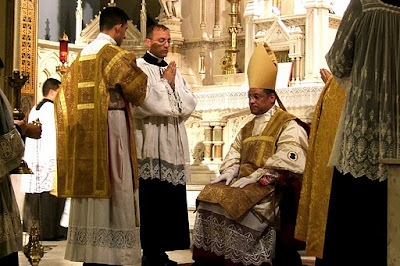 Gerard Saguto, FSSP, and Fr. Gregory Pendergraft, FSSP. Br. Corwin Low, O.P. sat in choir. The organist was Dr. Tom Joyce. COLLECT - ALMIGHTY, eternal God, look with mercy upon our infirmities, and stretch forth the right hand of Thy majesty to protect us. Through Our Lord Jesus Christ, Thy Son, Who liveth and reigneth with Thee in the unity of the Holy Ghost, God, world without end. BRETHREN, be not wise in your own conceits. To no man rendering evil for evil: providing good things not only in the sight of God, but also in the sight of men. If it be possible, as much as it is in you, having peace with all men. Revenge not yourselves, my dearly beloved; but give place unto wrath, for it is written, Revenge is mine; I will repay, saith the Lord. But if thy enemy be hungry, give him to eat; if he thirst, give him to drink, for doing this, thou shalt heap coals of fire upon his head. Be not overcome by evil, but overcome evil by good. AT THAT time, when Jesus was come down from the mountain, great multitudes followed Him; and behold a leper came and adored Him, saying, Lord, if Thou wilt Thou canst make Me clean. And Jesus stretching forth His hand, touched him, saying, I will, be thou made clean: and forthwith his leprosy was cleansed. And Jesus saith to him, See thou tell no man: but go, show thyself to the priest, and offer the gift which Moses commanded for a testimony unto them. And when He had entered into Capharnaum, there came to Him a centurion beseeching Him, and saying, Lord, my servant lieth at home sick of the palsy, and is grievously tormented. And Jesus saith to him, I will come and heal him. And the centurion making answer, said, Lord, I am not worthy that Thou shouldst enter under my roof: but only say the word, and my servant shall be healed. For I also am a man subject to authority, having under me soldiers: and I say to this man, Go, and he goeth: and to another, Come, and he cometh: and to my servant, Do this, and he doth it. And Jesus hearing this, marvelled; and said to them that followed him, Amen I say to you, I have not found so great faith in Israel. And I say to you, that many shall come from the east and the west, and shall sit down with Abraham, Isaac, and Jacob in the kingdom of heaven; but the children of the kingdom shall be cast into the exterior darkness: there shall be weeping and gnashing of teeth. And Jesus said to the centurion, Go, and as thou hast believed, so be it done to thee: and the servant was healed at the same hour. The human race was infected with the leprosy of sin: the Son of God touches it by the mystery of the Incarnation, and restores it to health. But he requires that the sick man, now that he is healed, shall go and show himself to the priest, and comply with the ceremonies prescribed by the law; and this, to show that he allows a human priesthood to co-operate in the work of our salvation. The vocation of the Gentiles, of which the Magi were the first-fruits, is again brought before us in the faith of the centurion. A Roman soldier, and millions like him, shall be reputed as true children of Abraham, Isaac, and Jacob; while they who are the sons of this Patriarch according to the flesh, shall be cast out from the feast-chamber into the gloom of blindness; and their punishment shall be given as a spectacle to the whole earth. Let man, then, saved as he has been by the coming of Emmanuel, sing a hymn of praise to the power of God, who has wrought our salvation by the strength of his almighty arm. Man had been sentenced to death; but now that he has God for a Brother, he shall not die: he will live: and could he spend his life better than in praising the works of this God that has saved him? SECRET - MAY THIS offering, we beseech Thee, O Lord, wipe out our sins, and sanctify the bodies and minds of Thy servants for the celebration of the sacrifice. Through Our Lord Jesus Christ, Thy Son, Who liveth and reigneth with Thee in the unity of the Holy Ghost, God, world without end. Amen. POST COMMUNION - O LORD, Who dost give freely the enjoyment of so great mysteries, we beseech Thee that Thou wouldst vouchsafe to render us truly worthy to receive their effects. Through Our Lord Jesus Christ, Thy Son, Who liveth and reigneth with Thee in the unity of the Holy Ghost, God, world without end. Amen. Motu Proprio Summorum Pontificum, Problem or Asset? Father Manuel's work is deserving. It is deeply concerned with obeying the Holy Father and is filled with joy and gratitude for the discovery of the traditional liturgy. or call at: 0034 619 011 226. As we pray for the Week of Prayer for Christian Unity, please join me in praying for the following intentions this week. Let us offer our Rosaries, our morning offerings, our sacrifices for these intentions. On January 12, 2012, Most Rev. Armando Ochoa, Administrator of the Diocese of El Paso, filed a lawsuit against me. Once again, I want to reiterate that his action is dishonest and unjust. I pose the simple question: over the course of the past 9 ½ years, who is the one who has been laboring, struggling, sacrificing day and night, and caring for the spiritual and material well-being of San Juan Bautista Catholic Church? Has it been Fr. 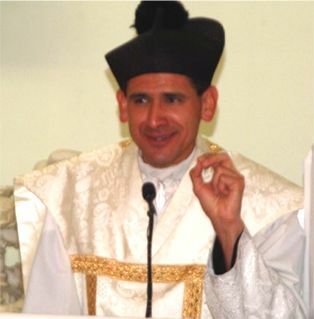 Michael Rodríguez or Most Rev. Armando Ochoa? Based on the factual record, which of the two has greater credibility when it comes to protecting and furthering the spiritual and material patrimony of San Juan Bautista? 20) I gave a monthly “mini-retreat” (in spanish) on First Saturdays for the Guadalupanas and other interested parishioners from 8:45-11:30 a.m, consisting of the Holy Rosary and a workshop on prayer. O Dearest Jesus, tenderly loving us, Thy greatest joy is to dwell among men and to bestow Thy blessings upon us! Though I am not worthy that Thou should behold me with love, I feel myself drawn to Thee, O dear Infant Jesus, because Thou dost gladly pardon me and exercise Thy almighty power over me. So many who turned with confidence to Thee have received graces and had their petitions granted. Behold me in spirit I kneel before Thy miraculous image on Thine altar in Prague and lay open my heart to Thee, with its prayers, petitions and hopes. Especially the affair of............I enclose in Thy loving Heart. Govern me and do with me and mine according to Thy holy will, for I know that in Thy Divine wisdom and love Thou wilt ordain everything for the best. 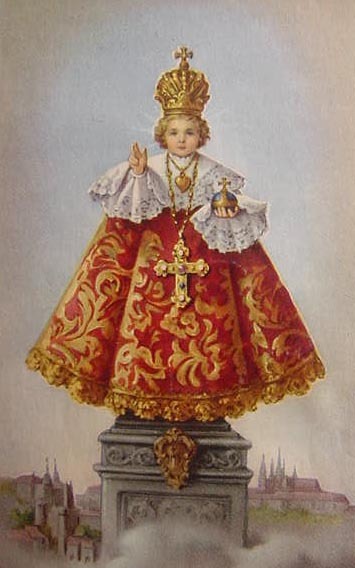 Almighty, gracious Infant Jesus, do not withdraw Thy hand from us, but protect and bless us forever. I pray Thee, sweetest Infant, in the name of Thy blessed Mother Mary, who cared for Thee with such tenderness, and by the great reverence with which Saint Joseph carried Thee in his arms: comfort me and make me happy, that I may bless and thank Thee forever from all my heart. Amen. Mr. Peter Sardegna, of Winona, Minn., well known to virtually all American Priest and Seminarians of the SSPX, for his restoration of St. Thomas Aquinas Seminary, will be given the Sacrament of Extreme Unction on January 14, 2012. Mr. Sardegna has been in declining health for the past several years, and your prayers are requested for him and his family at this difficult time. Personal notes or cards of well wishes, sent to Peter in care of the Seminary, would most certainly brighten his day. As one can notice, the Octave of the Epiphany ranked even higher than the Octave of Christmas! 29 December: St. John, Comm. of St Thomas Becket, the Octave of the Nativity, and the Dedication; Vespers of the preceding with Psalms from the Nativity, Comm. of the following, St Thomas, and the Octave of the Nativity and Dedication. 30 December: Sunday in the Octave of the Nativity, Comm. of the Octave of the Nativity, and the Dedication; Vespers of the preceding with Psalms from the Nativity, Comm. 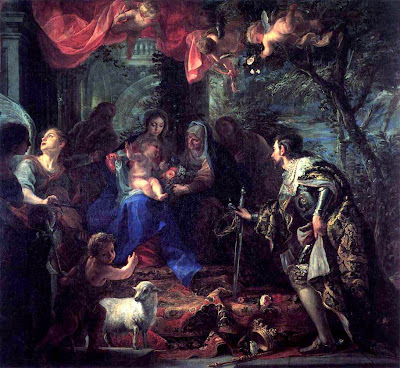 of the following and the Octave of the Nativity and Dedication. 31 December: St. Sylvester I, Comm. of the Octave of the Nativity, and the Dedication; Vespers of the following without any Commemorations. 1 January: Circumcision, no Commemorations; Vespers of the preceding without any Commemorations. 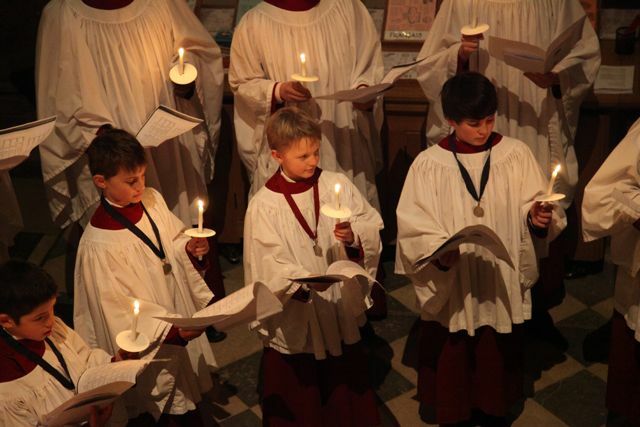 3 January: Octave Day of the Dedication, Comm. of the Octave of St. John; Vespers of the preceding, Comm. 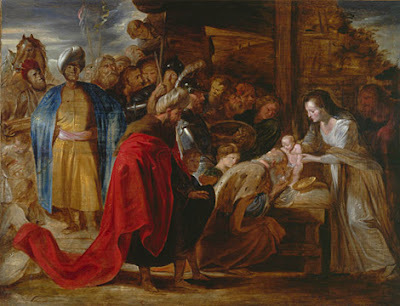 of the following Octave day of the Holy Innocents. While sometimes performed (but often neglected in the Novus Ordo), the Feast of the Epiphany is a time for the blessing of one's home using blessed Chalk and holy water. This traditional has a beautiful ritual in the Rituale Romanum and is described in my post: Blessing of Epiphany Chalk. Candlemas (The Feast of the Purification of our Lady) is another day in which the Novus Ordo calendar greatly overlooks in importance. The Feast of Candlmas, exactly 40 days after Christmas, commemorates Mary's obedience to the Mosaic law by submitting herself to the Temple for the ritual purification, as commanded in Leviticus. Update:The 2012 Devotion Drawing is now closed. Thank you for the 268 participants in this year's devotion! I am very pleased to again be a facilitator for the Patron Saint of the Year Devotion. I have been part of this annual tradition since 2006 and have helped coordinate devotions for hundreds of families. It is my pleasure to now be part of the 2012 Patron Saint of the Year Devotion. To start things off, the turnout this year has been great. I have posted below all of the results as 6:45 PM CST on January 1. I was chosen by St. Joachim, the father of the Blessed Virgin Mary! I am honored to be chosen by him and to read more on him in order to deepen my Marian devotion. I know that it is for this purpose that God has willed for me to be chosen by St. Joachim as a special protector for 2012. To save space, results and future result postings will be put in the comment box. USA: Cardinal Baum (em. Apostolic Penitentiary), Burke (Prefect of the Apostolic Signatura), Egan (em. Archbishop of New York), Foley (Grand Master of the Knights of the Holy Sepulcher in Jerusalem, +2011), George (Archbishop of Chicago), Levada (Prefect of the Congregation for Doctrine and the Faith), O’ Malley (Archbishop of Boston), Brunett (Archbishop of Seattle), Carlson (Archbishop of Saint Louis), Di Noia (Secretary for the Congregation of Divine Worship), Hugues (em. Archbishop of New Orleans), Kevin (em. Archbishop of Southwark), Myers (Archbishop of Newark), Nienstedt (Archbishop of Saint Paul in Minneapolis), Pilarczyk (em. Archbishop of Cicinnati), Vigneron (Archbishop of Detroit), Wenski (Archbishop of Miami), Backer (Bishop of Birmingham), Boyea (Bishop of Lansing), Bevard (Bishop of Saint Thomas), Blair (Bishop of Toledo, Ohio), Bruskewitz (Bishop of Lincoln), Burbidge (Bishop of Raleigh), Callahan (Bishop of LaCrosse), Conley (Auxiliary Bishop of Denver), Cordileone (Bishop of Oakland), Corrada (Bischof von Tyler), D´Arcy (Bischof von Fort Wayne-South Bend), Daniels (Bischof von Grand Falls), Dewane (Bishop of Venice), Di Lorenzo (Bishop of Richmond), Di Marzio (Bishop of Bofrooklynn), Doran (Bishop Rockford), Etienne (Bishop of Cheyenne), Farrell (Bishop of Dallas), Finn (Bishop of Kansas City), Foley (em. Bishop of Birmingham), Gainer (Bishop of Lexington), García (Bishop of Monterey), Hermann (Auxiliary Bishop of Saint Louis), Hurley (Bishop of Grand Rapids), Keleher (em. Bishop of Kansas City), Kicanas (Bishop of Tucson), Madera Uribe (em. Bishop of Fresno), Matano (Bishop of Burlington), McFadden (Bishop of Harrisburg), McManus (Bishop of Worcester), Morlino (Bishop of Madison), Murphy (Bishop of Rockville Centre), Nevares (Auxiliary Bishop of Phoenix), Olmsted (Bishop of Phoenix), Perry (Auxiliary Bishop of Chicago), Provost (Bishop of Lake Charles), Reiss (Auxilary Bishop of Detroit), Rhoades (Bishop of Harrisburg), Ricken (Bishop of Green Bay), Sample (Bishop of Marquette), Serratelli (Bishop of Paterson), Silva (Bishop of Honolulu), Slattery (Bishop of Tulsa), Timlin (em. Bishop of Scranton), Tobin (Bishop of Providence), Waltersheid (Auxiliary Bishop of Pittsburg), Van Johnston (Bishop of Springfield, Missouri). And herein lies the beauty of this liturgy. 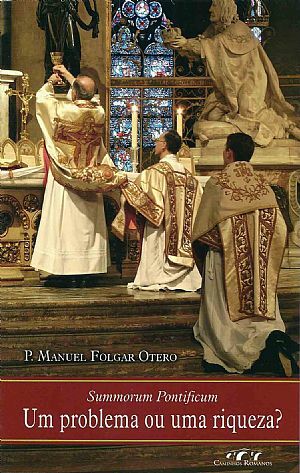 A Roman Catholic at one time could go to mass anywhere in the world and would hear the same ancient language (Latin) of the Holy Sacrifice of the Mass. Truly holy, Catholic, and Apostolic. What Souls are Closest & Dearest to Jesus? One day, whilst she was hearing Mass, at the elevation of the Sacred Host, she saw the infant Jesus on the altar, and with him three young virgins. Jesus took the first and caressed her very much. He went to the second, and, having taken her veil off her face, he struck her severely on the cheek, and turned his back upon her; but soon after, seeing the child looking sorrowful, he comforted her with all sorts of kindness. At last he approached the third; he seized her by the arm as if he were angry, struck her, and drove her away from him; but the more she saw herself ill-used and driven off; the more the little virgin humbled herself and followed him: and thus the vision ended. This devout woman, remained in the church with great desire to know what was the meaning of the vision, Jesus appeared to her again, and told her that there are on earth three sorts of souls that loved him. Some love him; but their love is so weak that if they are not coaxed by spiritual pleasures they become uneasy, and are in danger of turning their backs upon him; and of these the first virgin was a figure. The second represented those souls who love him with a less feeble love, but who require to be comforted from time to time. Published by the Redemptorist Fathers in 1927, pg 164 of the reissued 1983, printing of this book. Saturday Devotions to the Blessed Virgin Mary.